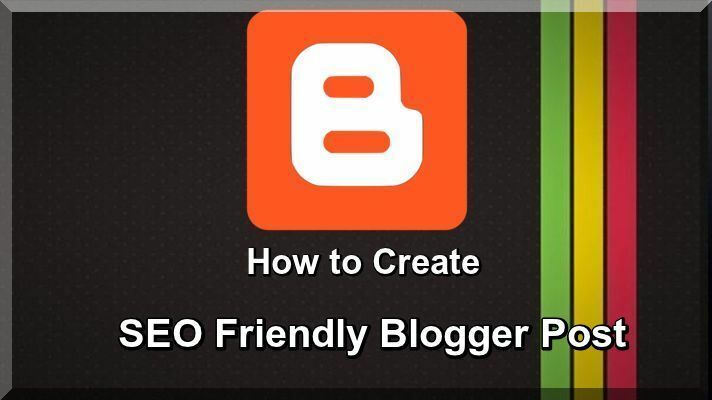 By this useful Article I guide you that how to create Blogger Post Search Engine friendly, and drive traffic. The blogger posts can have an awesome quantity of information your readers, visitors and other writers like good tutorials and come to your blogger time to time. The method is to organize the information about your post easily so readers are not scared by the length or amount of your blogger content. How to organize your blogger post this is the question, he main points to read the blogger post is that use your blogger post outline as a lead and be sure to develop on all of your points as per requirement. First you think and read and get full knowledge and then write better for others, and if necessary, does bonus study to collect more information, data examples, which are consisting on your main topic of the post. Introduce your topics as a summary in the starting which topic you are writing so. Make and correct your sentences, spelling errors, grammatical mistakes, you read as those others understand your language and use only simple language. Do not copy contents from other articles make your own words, people like informative things. You Now I introduce following three main tools such tools help you to write your better blogger post. Power Thesaurus: Power Thesaurus is great tool that provides many alternative word choices from a community of writers online topics which you have already selected. ZenPen: If you feeling problem continue focused, check out this diversion free writing tool. This tool make easy simple writing zone designed to support you get words down without having to bother with formatting good. Cliche Finder: If you feeling like your writing might be pending off a little tacky which Identify example where you can be more detailed using this handy tool. Ok now you are ready to write some things on any topic, first select your main headings what about you write in your blogger post. Now you should be read this Article how you write the heading of the post I have mentioned topics in my blogger posts and also I have described separately read this tutorial. If you want to make your headings Sub-heading beautiful add following code above of this code ]]></b:skin> and search this code in your blogger template. Now you are making your blogger Post, during the making of blogger post see the right side of your post Settings and the following things have been mentioned . Labels: Labels are very important but one thing note that robots.txt did not index such type of labels make your label url no-follow, and add minimum two labels only not add large number of labels in your blogger post. Schedule: Do not worry blogger automatically detect your post date and time. Links: This is very important blogger automatically deducted your blogger post url but it is not good practice make your permalinks, how to make permalinks of your blogger blog read this tutorial. Location: This is also auto deducted by blogger. Search Description: This is very important thing that add your blogger post Description, do not add short description, you should be use minimum 150 character and above not less than, your blogger description index by Search Engine. Read this tutorial for more guidance. Before you even compose anything for better Blogger post you have to pick a subject for your blog entry. The point can be quite broad to begin with. For instance, in case you're a handyman, you may begin supposing you need to expound on cracked spigots. At that point you may think of a couple of various working titles as such, cycles or diverse methods for moving toward that theme to enable you to center your written work. For instance, you may choose to limit your subject to "Apparatuses for Settling Broken Fixtures" or "Basic Reasons for Flawed Spigots." A working title is particular and will manage your post so you can begin composing. How about we take a genuine post for instance: "How to Pick a Strong Theme for Your Next Blog Entry." Proper, correct? The subject, for this situation, was presumably basically "blogging." At that point the working title may have been something like, "The Procedure for Choosing a Blog Entry Theme." And the last title wound up being "The means by which to Pick a Strong Point for Your Next Blog Entry." See that advancement from subject, to working title, to definite title? Despite the fact that the working title may not wind up being the last title (more on that in a minute), regardless it gives enough data so you can concentrate your blog entry on something more particular than a non specific, overpowering subject. Look to the following points. I hope this article is very important like other tutorials, if you like it please leave your comments.